A traditional way of serving lamb, but done with a herby twist from the oregano and a zesty one from the lemon. Serve with steamed green vegetables, and a Spanish red – perhaps a bottle of Tempranillo. 1. Mix together the lemon juice, olive oil, garlic and oregano. Place the lamb in a large roasting tin and make some incisions all over the leg using a small, sharp knife. Pour over the lemon mixture and leave to marinate, covered, in the fridge for 1-2hours, if you have the time. 2. Preheat the oven to 200˚C, gas mark 6. Roast the lamb for 45 minutes then add the potatoes to the tin, turning to coat them in the juices. 3. Roast for a further 45 minutes until the lamb is nicely browned but the meat is still a little pink on the inside. 4. Lift the lamb onto a board, cover with foil and leave to rest for 10-15 minutes. Drain any juice from the tin (add this to the gravy) and return the potatoes to the oven for a further 10-15 minutes until tender and golden brown. 5. 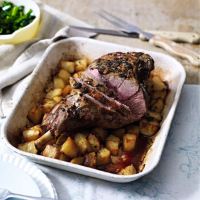 Carve the lamb and serve with roast potatoes, gravy and some steamed green vegetables. Take the lamb out of the fridge abd leave at room temperature for an hour before cooking to get the best roast that's slightly pink in the middle.